When assistant professor Jakob Magolan came to the University of Idaho in fall 2010, Ray von Wandrusz­ka, chair of the College of Science’s Department of Chemistry, told him the university has a very gifted undergraduate population, and he should make sure to seize that opportunity. Magolan has taken this advice by offering many undergrads the chance to earn credit for assisting in research in his lab. Magolan has worked hard to include undergraduates in his research at UI, having them work alongside him and his graduate students. Right now, he has six undergrads and three graduate students on his team — and the word team means a lot to Magolan. Undergraduates not only serve as research assistants to graduate students, but they also get hands-on experience and education to supplement their classwork. “Our weekly meetings emphasize advanced organic chemistry educa­tion and cover a range of topics that extend beyond our own research activities,” he said. 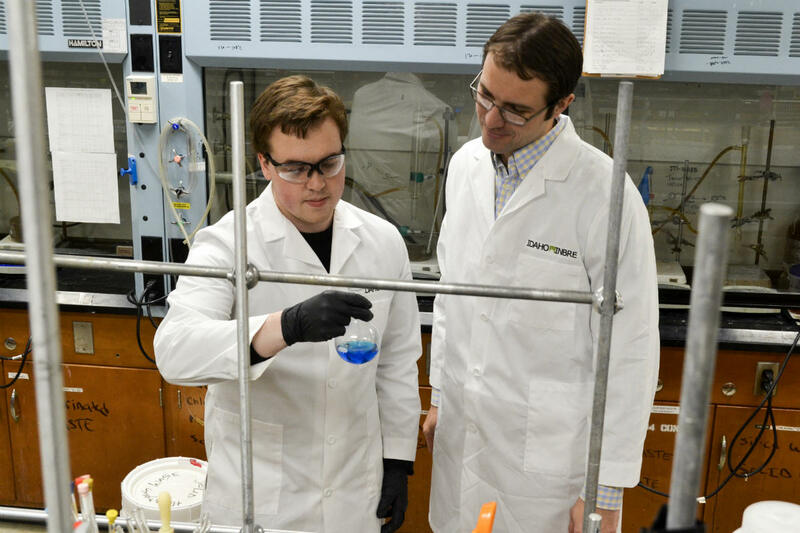 Assistant professor Jakob Magolan works with an undergraduate student in his chemistry lab in Renfrew Hall. Almost all of Magolan’s undergrad students receive their first significant laboratory training under him. These experiences have already led seven former UI undergrads to be accepted into doctoral programs at chemistry departments around the country. His research team has even brought in students from Lewis-Clark State College, University of Wyoming and Brigham Young University. Several of the undergrads he recruited have co-authored articles in respected scientific journals before earning their bachelor’s degrees. While under his supervision, undergraduate students have also applied for and received grants to support their research. 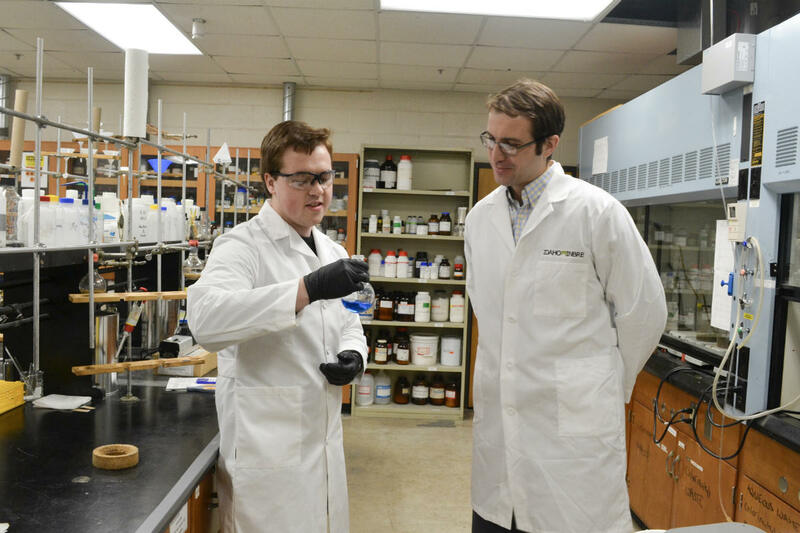 Fellowships such as the Idaho INBRE summer fellowship and the Hill Undergradu­ate Research Fellowship have given thousands of dollars to undergrad­uates studying organic synthetics at UI. WRITER: Keegan Lawler, a junior from Rathdrum, Idaho, is majoring in English with an emphasis in creative writing. PHOTOGRAPHER: Chuan He is a sophomore from Zhuhai, China, studying secondary education with an emphasis on social studies.